A big theme of Hamilton is that history lives at the whim of whoever tells your story. Well, we’re betting a corollary to that lesson is: History lives at the whim of how hammered the guy telling your story is when he tells it. We’ll find out for sure this fall, when Lin-Manuel Miranda narrates the Alexander Hamilton/Aaron Burr rivalry on an episode of Drunk History. Presumably Miranda’s going to have a fresh take on the story, since rapping and slurring do not an elegant combination make. The news of Miranda’s appearance actually comes as a SHOCKING reversal, as Miranda, a Drunk History fan, once noted that Alexander Hamilton was the subject of the show’s very first lesson, shutting down the possibility of his reprising the story on the show. 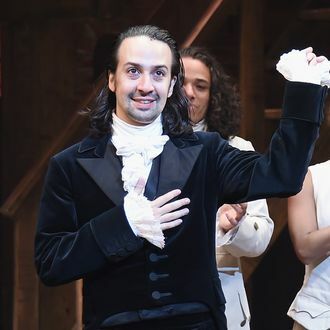 Last December, he tweeted: “Hamilton was the first story ever told on Drunk History. I’d have to get drunk and tell you something else.” Don’t feel bad, Lin. Forgetting history is the drunk way, and repeating it is downright all-American. Drunk History’s creator Derek Waters announced the news of Miranda’s appearance at the show’s Comic-Con panel on Thursday. More guests set for season four of the Comedy Central series include Paget Brewster, Busy Phillips, Mae Whitman, Jack McBrayer, David Koechner, Billie Joe Armstrong, Rachel Bilson, Michael Cera, Josh Charles, Kat Dennings, Ben Folds, Dave Grohl, Tony Hale, Ed Helms, Thomas Middleditch, Elizabeth Olsen, Aubrey Plaza, Ronda Rousey, Liev Schreiber, and Alia Shawkat, among others. Salud!